On a hot, sunny day in Las Vegas, mathematicians from all over the U. S. competed in the 42nd annual American Regions Mathematics League (ARML) competition held at University of Nevada, Las Vegas. Hawaiian music on the ukulele and jazz music on the saxophone complements the laughing and bustling of the Irvine community visiting the various Math for Service (MFS) booths; the annual MFS Open House is back. From Rubik’s Cubes to estimation games and everywhere in between, Orange County Math Circle (OCMC) hosted its first ever OC Math Carnival on Saturday, July 1 from 3:15 - 4:45 p.m. at Ardent Northwood facility designed for fourth through sixth graders. 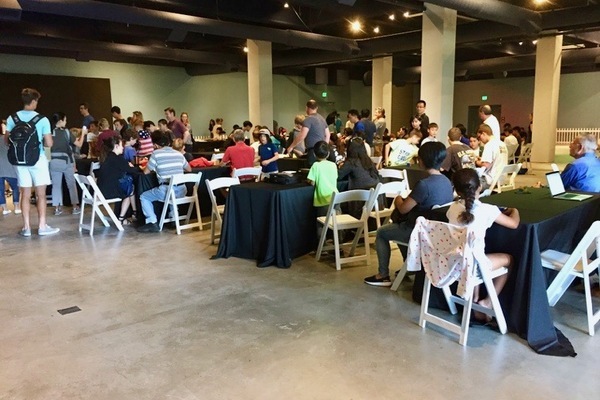 The Orange County Math Circle teamed up with the World Cube Association to hold a Rubik's Cube competition at the Discovery Center in Santa Ana on April 24.